We are getting together in person on both day one and day two of Design and Construction Week 2019. Put this day two KBtribechat event on your show planner! We want to see you there. Our Wednesday, KBtribechat discussion on February 20th will be hosted by Thermador in booth C3830. Join us at 11am until noon Vegas time. Attendees will gather during the weekly KBtribechat hour to network, share show highlights on social media, plus see the latest from Thermador first hand. Join our fun! Big thank you to Lisa Stewart Photography for sharing her amazing work with us. 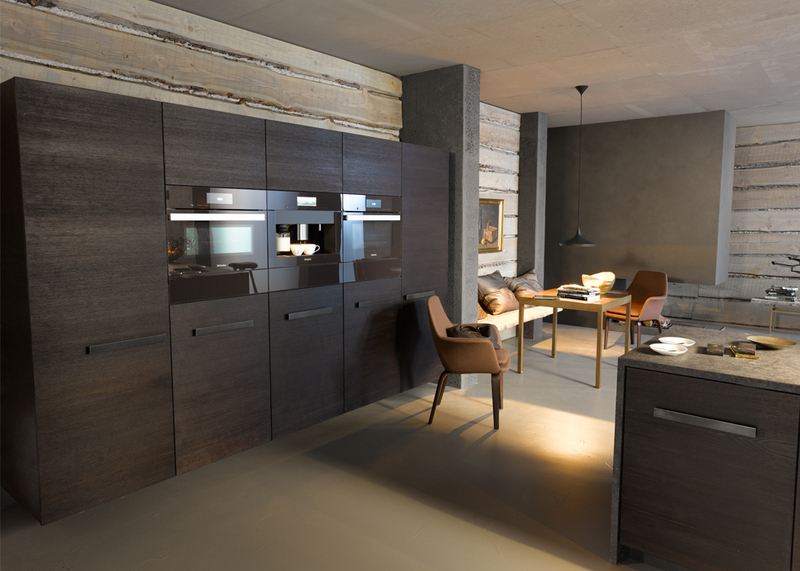 We are excited to announce that Miele, DXV and Mr. Steam are sponsoring our KBtribechat progressive event at Dwell in Los Angeles. This three stop tour will embrace things that make for better living. Mark your calendars and plan to start the show meeting up with your KBtribe friends! The first stop on the tour is Miele, Booth 1301, where Miele will unveil “Design for Life” and its newest generation of built-in appliances, including ovens, steam ovens, combi-ovens and coffee systems. The new series is the most significant Miele product launch in the United States. Setting benchmarks in design, technology and innovation, Miele ensures unprecedented convenience, performance and elegance. Experience the series with live culinary demonstrations in the Miele space and see how each appliance flawlessly complements another in form, function and materials – elevating the culinary experience. Why is it important for manufacturers to develop appliances that are “Designed for Life” as opposed to just functionality? How do you see Truffle Brown finding its way into the design scene? As American Standard Brands enters its fifteenth decade of business, it proudly launches DXV by American Standard, a flagship portfolio of luxury bath and kitchen products celebrating the company’s distinguished 140-plus-year heritage. DXV by American Standard comprises a premium selection of meticulously crafted fixture and faucet collections curated into four broad movements from the last 140 years: Classic (1880 – 1920), Golden Era (1920 – 1950), Modern (1950 – 1990), and Contemporary (1990 – today). More than reproductions, these exquisite products blend the artisanal character of the past with the aesthetic and performance sensibilities of today. The portfolio also includes a collection of kitchen sinks and fittings, as well as the AT Series, a state-of-the-art smart toilet recently profiled in the Los Angeles Times. To Bidet or Not to Bidet: Is America ready? 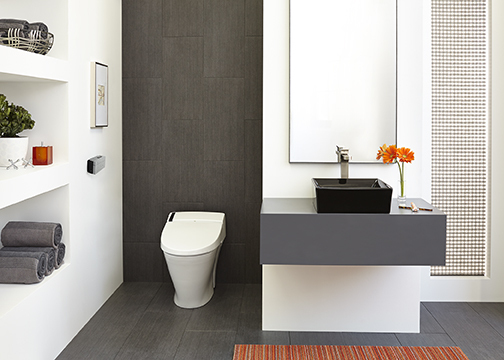 Will smart toilets gain acceptance? What could bath manufacturers offer to help you bring wellness to home bathrooms? Your work as design professionals makes life better for your clients. The colors they see and the textures they feel create the emotional response they have every time they walk into their home. Perhaps no space in the home makes this connection more than the bathroom, where your expertise touches the most personal aspects of your clients’ lives. A home steam shower from Mr. Steam, the Feel Good company, can be the difference between creating a beautiful bathroom and designing a complete in-home wellness experience. Regular steam sessions can benefit respiratory health, nourish and hydrate skin, and promote restful sleep, just to name a few of the 44 benefits of steam showers. Steam showers are the sustainable luxury, using no more than two gallons of water for a 20-minute steam. Help educate your clients with the Steam Showers Buying Guide from Mr. Steam. Life is better when you feel good. Mr. Steam is Feel Good, Inc.
What do you think are the top 10 benefits of steam? Meet us in the Amerock Hardware booth N137 at 1pm for the first stop on our progressive KBtribechat event. We’re thrilled to be leading a special edition #KBTRIBECHAT on the show floor at KBIS! Join us for from 1:00 to 2:00 at the show on Tuesday, February 4. The sponsors for this chat, Amerock, Wellborn Cabinetry and Cambria are all launching new designs and innovative initiatives at KBIS 2014. We’ll be weaving our questions in and around these exciting sponsor developments for a lively, inspiring chat! Q1 Functional can be beautiful e.g. @amerockhardware’s new NOW collection. Share ways to take practical to perfect! Q2 Copper is back & big! @amerockhardware has new brushed copper finishes. What do you pair with copper? Q3 Cabinetry can be used in every room & @wellborncabine1 is nailing this! What unexpected places can you use cabinets? Q4 @WellbornCabine1 are always innovating. What are some unique ways manufacturers can stay ahead of consumer expectations? Q5 The @CambriaQuartz design palette is most extensive in industry. What colors do you see as “risk taking” in surfaces? Q6 @CambriaQuartz booth has incorporated influences from the fashion industry. What fashion influences do you see in K & B trends? Remember to follow along using hashtags #kbtribechat and #kbis2014. Make sure to follow our sponsors: @KBIS2014, @AmerockHardware, @WellbornCabine1 and @CambriaQuartz. 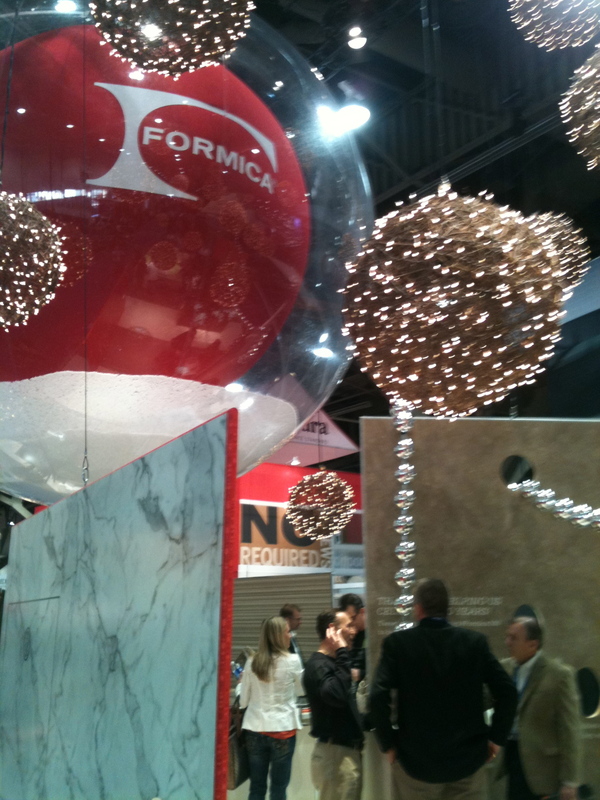 Formica Group is hosting our Wednesday KBtribechat discussion LIVE in their booth! Join us from 11am to 12pm PST. In addition to our regular #kbtribechat participants, we encourage all KBIS attendees and exhibitors to join us for the annual face-to-face Twitter chat and networking event. Q1: What are some of the top new products being unveiled at @KBIS2014? Q2: Which new home technology products make you most excited? Q3: How are manufacturers using technology to replicate natural materials (i.e. faux-spotting)? Q4: Design around Radiant Orchid, Pantone’s Color of the Year. Share complementary product finds from @KBIS2014. Q5: What are the must-see booths of @KBIS2014? KBIS attendees and exhibitors – Reference our chat questions as you walk the show on Day 1. Take lots of photos (please note exhibitor information) and report your findings from 11 a.m. to noon on Wednesday, Feb. 5, using the #kbtribechat hashtag. Make your way to Formica Corporation’s booth (N1063) during the chat time, network and enjoy a cookie (or two). #kbtribechat friends experiencing the show via social media – Hop on the weekly chat at its regularly scheduled time and experience the show through the eyes of your colleagues. Ask questions. Share your thoughts. And, revel in the fact that you’re not being tempted by the cookies! Images captured in our show reporting will be posted on the #kbtribechat Design & Construction Week 2014 Pinterest board. Be sure to follow @KBIS2014,@kbtribechat and @FormicaGroup on Twitter during Design & Construction Week to get a front-row seat for all things KBIS. Here is the transcript for our KBIS week! Tagged as Amerock, Cambria Quartz, Formica Group, kbis, KBIS2014, kbtribechat events, tweet up, Wellborn Cabinet Inc.
#KBTRIBECHAT is good for your health! Mark your calendar for a special edition, lifestyle #KBTRIBCHAT on Friday, June 21st at 11:00 PST/2:00 EST brought to you live from the three locations at Dwell on Design. Our progressive tweetup will explore healthy cuisine and healthy lifestyles and how it relates to kitchen and bath professionals. Not attending Dwell on Design? Follow the fun and action using hashtag #kbtribechat and be sure to support our sponsor accounts @MieleUSA, @steamtherapy and @capitalranges. The first stop on our tweet tour is Miele, Booth 631 where you will experience live culinary demonstrations, showcasing the new Miele Combi-Steam Oven. As the pioneer in steam oven technology, Miele has perfected the art of steam cooking with this latest innovation. As its name implies, the Miele Combi-Steam Oven combines the power of steam and convection technology into one appliance. Whether using steam, convection or combination mode, the look and taste you receive are healthy, gourmet results. Next stop is Mr. Steam, Booth 1730, where Martha Orellana, a.k.a. “Mrs. Steam” will talk about the health benefits of a daily steam (just look at her beautiful skin while she talks! ), and why steam showers are the best choice for new and remodeled bathrooms, large and small. The tweetup ends at Capital Cooking, Booth 1331, where we will discuss kitchen design for true “foodies” and what home chefs look for in appliances. Organic, local produce with a twist will play a starring role prepared on Capital Culinarian ranges.